Our cultural heritage is closely linked with Latin – the lingua franca in the days of the Roman Empire – which still plays an important role today, above all in medicine, theology and biology. If you are interested in studying and analysing the Latin-speaking ancient world then Latin Philology is the degree programme for you. If you want to teach Latin, you can study Latin as a teaching degree for secondary schools (Lehramt Gymnasien). The Bachelor's degree programme consists of three phases, the teaching degree programme consists of four phases. 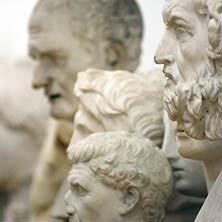 In the first two semesters, you gain broad basic knowledge of language practice, linguistics, literary studies and cultural studies of antiquity. In the second phase, you can refine your specialist and methodical skills. In the third phase, you can specialise in an area of your choice. Teaching degree students can choose specialisation modules in prose or poetry after the sixth subject semester. You can study Latin philology as a first or second subject in combination with another subject. For more information on which other subjects you can choose from, please contact the Student Advice and Career Centre (IBZ). The teaching degree (Lehramt) in Latin is largely identical with the Bachelor's degree programme Latin Philology. However, as a future teacher you also study teaching methodology and education theory. This degree programme prepares students for a broad range of careers in media, journalism, libraries, publishing, adult education and other areas of language teaching and at the intersection of business and culture. When you study Latin as a teaching degree (Lehramt) and you have completed the first State Examination (Staatsprüfung) you can become a teacher at a secondary school after a two-year teacher training (Referendariat) and passing the second State Examination.